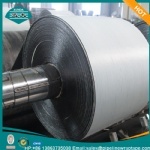 It is polymer modified asphalt-based materials, the surface covered with polyethylene film, aluminum foil, the base covered with a removable Polyethylene film protection kind of self-adhesive flexible waterproof membrane. It has a good self-adhesive can and bending properties, construction is simple, clean, and can be widely used in roofing, basement, bathroom, etc. waterproofing works, and for legislation to pave and stick and pipe wall (except heat pipes), bridges , and other complex environment, especially in open flame is prohibited, covert fire waterproofing works.,Low-temperature-resistant properties of the product, and the MTR, tunnels and the scene of the fire with the best waterproof, moisture resistance and sealing materials, also apply to pipeline waterproof, anti-corrosion works. 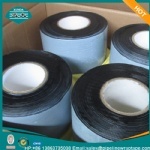 How to apply steel pipe wrapping tape bitumen tape XUNDA T 600 ? -Manufacture of Polyethylene coatings utilizing Butyl based elastomeric adhesives, Polyethylene films and liquid adhesives for corrosion protection of steel pipe. -Provides corrosion protection with the inherent chemistry of Polyethylene and Butyl Adhesive for resistance to water and oxygen penetration. Oxygen and Water are prevented from reaching the metal substrate, which are necessary and sufficient conditions for corrosion. -Manufacture of conventional and specialty Polyethylene, Polypropylene and Polymeric Alloys and coating systems for pipe corrosion protection.